• Program-wide changes, such as changes to palettes, color settings, actions, and preferences, are not changes to a particular image and so are not added to the History palette. • By default, the History palette lists the previous 20 states. Older states are automatically deleted to free more memory for Photoshop. To keep a particular state throughout your work session, make a snapshot of the state. 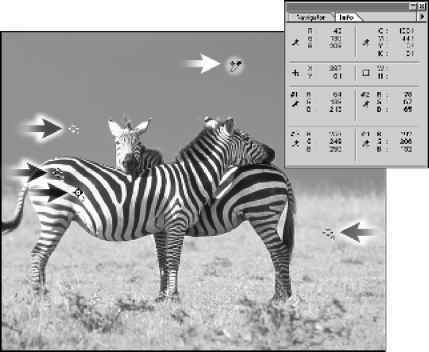 For more information, see "Making a snapshot of an image (Photoshop)" on page 40. • Once you close and reopen the document, all states and snapshots from the last working session are cleared from the palette. • By default, a snapshot of the initial state of the document is displayed at the top of the palette. • States are added from the top down. That is, the oldest state is at the top of the list, the most recent one at the bottom. • Each state is listed with the name of the tool or command used to change the image. • By default, selecting a state dims those below. This way you can easily see which changes will be discarded if you continue working from the selected state. For information on customizing the history options, see "Setting history options (Photoshop)" on page 40. • By default, selecting a state and then changing the image eliminates all states that come after. • If you select a state and then change the image, eliminating the states that came after, you can use the Undo command to undo the last change and restore the eliminated states. • By default, deleting a state deletes that state and those that came after it. If you choose the Allow Non-Linear History option, deleting a state deletes just that state. For more information, see "Setting history options (Photoshop)" on page 40.